Toyota has announced a recall involving nearly 2.5 million U.S. vehicles and 7.4 million cars globally due to a faulty power driver’s window switch that could lead to a fire. Toyota USA announced today that it will conduct a safety recall of approximately 2.5 million U.S. vehicles and up to 7.4 million cars globally. 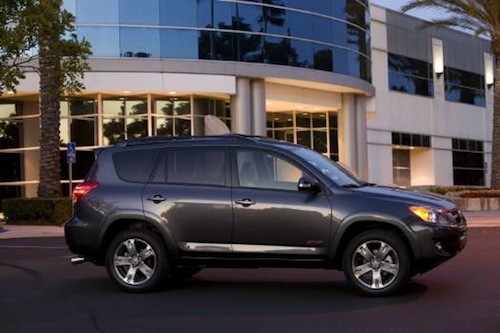 The Toyota recall is due to a faulty driver’s side power window switch that will stick or catch during normal operation. Toyota says the faulty power window switch can be fixed by applying a special fluorine grease to the Power Window Master Switch (PWMS). Toyota is cautioning that if commercially available lubricants are applied to the switch in an attempt by owners to fix the sticky power driver’s window, smoke could occur and it could “lead to a fire under some circumstances.” In the U.S. alone nearly 2.5 million 2007-2009 model Toyota vehicles are being recalled. Toyota will send out a notification letter to owners of the affected cars and ask them to bring in their vehicles to have the cars inspected. Dealers will inspect, disassemble and apply the special fluorine grease to the power switch assembly. The dealer will inspect and repair the power switch at no charge to the vehicle owner. Toyota warns that the owner of the vehicle should not attempt to fix the sticky or “notchy” window themselves with a commercial lubricant. The number of Toyota cars affected by this recall is the biggest auto recall since the huge Ford recall in 1996. And this recall by Toyota will be close to the 9 million Toyota vehicles that were recalled from 2009-2011. That involved three separate recalls after reports that several vehicles experienced unintended acceleration issues. The issue caused Toyota to suspend sales of certain vehicles for several weeks while the Japanese automaker awaited replacement parts. Toyota had to deal with reports of 21 deaths that were alleged to have occurred as a result of the accelerator pedal recall. The current driver’s side power window switch issue may be caused during initial assembly by the supplier. If an uneven application of the special grease was applied at the supplier, during normal use of the power window, the grease can become carbonized and the lubricant will eventually fail. The lack of proper lubrication leads to the Power Window Master Switch sticking and not working properly. This current power window recall is just the latest issue for the Japanese automaker to deal with. The automaker was affected greatly with the 2009-2011 accelerator pedal recall, and then in 2011 Toyota was affected by the Japan earthquake and tsunami that shut down plants and supplier operations. Toyota who is the world’s number one automaker took a big hit and is just now recovering from that natural disaster. It will interesting to see how this latest global recall will affect the Japanese automaker. They have overcome two large problems since 2009 and still remain committed to the goal of staying number one. Toyota CEO Akio Toyoda is very competitive, and he will make sure this latest recall will be handled properly. Look for Toyota to bounce back from this latest recall and it will be just a bump in the road for the Japanese automaker. Toyota says owners of U.S.vehicles covered by this safety recall will receive an owner notification letter via first class mail starting in late October 2012. Owners will be instructed to take their vehicles to a dealer for repair and it will take approximately one hour depending on the dealer’s work schedule. Toyota is asking the affected owners to contact them at www.toyota.com/recall and they can also call the Toyota Customer Experience Center at 1-800-331-4331 to get more information.